Bystanders are refusing to let cold temperatures put a damper on watching Macy's Thanksgiving Day Parade, breaking out the blankets and sleeping bags to watch the giant balloons go by. See photos. 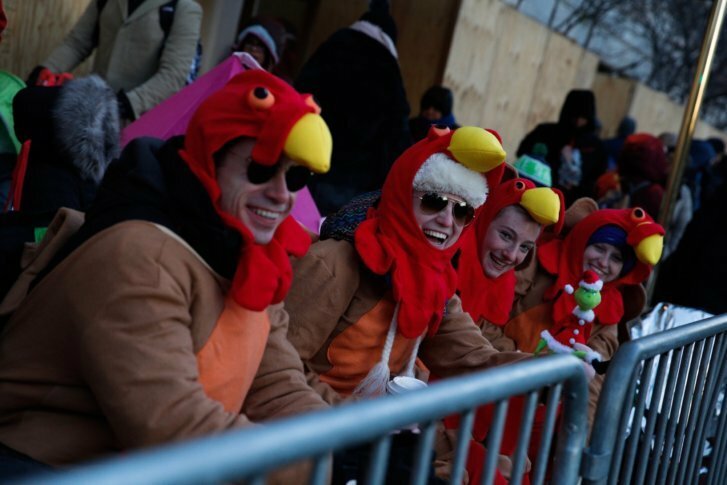 NEW YORK (AP) — Frigid weather and blustery winds didn’t chill the enthusiasm at the Macy’s Thanksgiving Day Parade, where spectators bundled up in blankets and sleeping bags and the giant character balloons flew lower than usual. “Ohhh, I’m freezing and numb, but excited,” said Stout, who had traveled from Columbus, Ohio. Thursday was one of New York City’s coldest Thanksgivings, with National Weather Service data showing the temperature peaked at 27 degrees (minus 2 Celsius). The coldest on record was in 1871, when the warmest it got was 22 degrees (minus 5 Celsius).